If you don’t see your questions answered here, please call us at 888.354.1118 or email. We would love to hear from you! Q | Why the unique name? A | Our name speaks to both the attributes of our product and the process of application—it’s also meant to be memorable. As the name suggests, we create innovative products to make what was impossible (cementitious flying pigments), possible. Q | What drove your decision to develop this product? A | The application of a finish onto block, brick or concrete has been an obstacle for many years. The substrate itself is complicated and finishes often bubble or peel when water builds up behind them. Our product is low-VOC (<20g/L), UV resistant, and is purposely designed to scavenge and use the water to its benefit providing a unique solution to a difficult problem. Q | Who is your product designed for? A | The Flying Pig Coatings line of exterior coating is designed for both new construction projects as well as renovation projects. Our customers include architects, designers, builders, contractors and pro applicators. Q | Do you have any project examples that demonstrate the use of your product? A | We sure do. We’re happy to provide you with client case studies to show how we can make pigs fly. Q | Do you apply the product? A |No, we are manufacturers. Q | Do you sell retail? A | We do not, but we do recommend a professional applicator and have a running list on our website. Q | Where can I buy your product? A | Place orders directly with Flying Pig Coatings (call, email or via your sales rep) OR through a pro applicator. Q | Where is your product made? A |We proudly manufacture our product in Grand Rapids, Michigan, USA. Q | Is your product on spec? A | No; however, we have arranged with Arcat to provide specification services to our clients. We have specifications defined and are currently working with architects and designers to qualify our product. Q | Who are your “partners”? A | We cultivate partnerships with industry experts. Our partners include architects, chemists, designers, builders, contractors, pro applicators, colorists, etc. Q | Why would I use a cementitious coating? A | Our product is a block filler, primer and finish coat all in one. Our formulation converts moisture to create enhanced strength and durability helping to reduce maintenance. Our product goes on thin, meets critical ASTM requirements, and reduces material usage and labor costs. Q | How long will your product last? What’s the warranty? A | Accelerated tests give us the confidence to provide a 5-year 100% product replacement warranty. As our accelerated testing and field results continue, we will have a more quantifiable answer. A |Yes! We’re happy to share case studies of client projects to show how we can make pigs fly. Q | What do you mean when you say “breathable coating”? A | Our coating is designed to allow a substrate to breathe – allow water vapor to leave the substrate while at the same time exceeding wind-driven rain tests. Q | What do you mean by scavenges water? 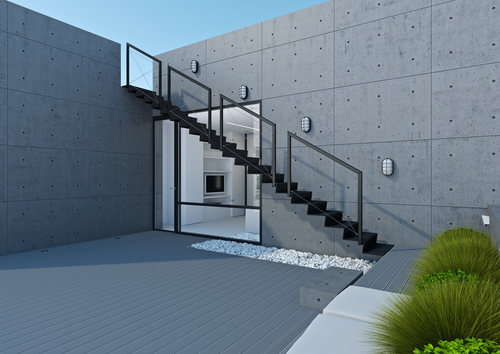 A | Cement uses water to build strength and durability; the cement in our technology uses water in combination with cement and polymer to scavenge and leverage water in the design. Q | You mention material flexibility, how much flex can I expect? A | Our applied material has passed ASTM mandrel bend testing to 1/8”, the lowest tested bend criteria in the industry. Q | How does your product compare in its ability to hide surface imperfections? A | Our product’s ability to hide is equal to or greater than most products in the industry. Q | Does your product stain block like a primer or block out existing colors? A | Our product functions as a coating, not a stain, offering very good coverage over existing colors. Q | How does your product handle embedded metal and rust? A | As with any paint or coating, rust and embedded metal is an issue. Proper treatment is critical before application and is dependent on the metal and condition. Q | Can I use your coating on floors? A | No. Our first technology has been created for use on vertical surfaces and is not formulated for the unique needs of horizontal surfaces. Q | What is different about application compared to traditional paint? Begin the application process sooner after power washing and apply the second coat much sooner than with other products. Because the product is cement based, extra care must be taken in cleaning the equipment. Q | What weather/temperature considerations impact application? A | For best results, apply only when both surface and ambient temperatures are above 50° F (10° C) and below 100° F (38° C). Q| How does your product work over existing painted surfaces? A | Our product is only as good as the surface it is applied to. Proper surface preparation to remove dirt, oils and loose coatings is required to assure a proper bond. Q | How many coats are needed? A | Our product meets ASTM standards for wind-driven rain and water vapor permeance with one coat; however, every building is unique and requires evaluation. Because it’s an all-in-one system, we find our product requires one less coat than comparable systems. Q | What is your product’s pot life? A | 7 hours following mixing of two-part system. Q | What is your product’s drying time? A | @ 75°F, 50% RH: To touch in 20-minutes, recoat in 1 hour. Q | How does your product touch-up? A | Our product touches up well. Please contact us for touch-up tips based on your project/need. Q | How do I make sure my people know how to use your product? A | We offer in-person training seminars and online video training sessions. We also offer certification programs for jobsite foremen. Q | What size/type of sprayer do I use? A | You’ll need a gas or electric airless sprayer able to meet or exceed a pressure of 2200-3300 psi. Q | Will the thick coating pack my pump? A | Our product has been designed to work with airless spray systems. Due to the material, flushing the system after use is critical to maintaining equipment. Details are in our literature and covered during training sessions. Q | Do I need any special equipment to apply your product? A | Our system is designed to be applied using a standard airless spray system such as a Graco 695 or greater. For best results we recommend using our double-helix mixer and stand. Q | How much is your mixing stand? A | Total investment is less than $2,000 and includes stand, electrical, mixer and dual-helix blades. The mixing system helps streamline mixing and assure a good mix on the jobsite. Q | Why can’t I use the drill-mixer I use on all other two-component products? A | You can; however, our product blends a powder and liquid requiring a more consistent approach. To assure consistency, we recommend very specific hardware. Q | Can I brush & roll? A | Yes, we recommend a 1/2” nap or thicker roller. Q | Why aren’t there more colors? A | Our current palette is limited to Iron Oxide pigments to assure extremely low VOC and reduce fading. Future palettes are in the works. Q | Does it come in clear? A | A clear version is not yet available in our 20-color palette. Q | Do you offer color matching? A | At this time we do not; however, our plan is to offer matching within our pigment range. Q | Can I get a whiter White? A | We offer two shades of white based on the limitations of our raw material. We will continue to stretch our technology to achieve a broader range of whites. Q | What is sheen? Do you have low luster/satin? A | Sheen is the gloss level of the coating. Our product is designed as a flat with an extremely low sheen. Q | Can I get more texture? A | Texture is fixed; however, application plays a key role. Back rolling can increase the texture. Q | Do you have color samples or a fan deck? A | Yes. We have a sample kit with accurate color samples sprayed on a cement board substrate. For the most accurate samples, we will replicate on the client’s building and/or a sample of the actual structure substrate. Q | How do I order your product? Q | How many square feet of coverage can I expect from a gallon? Q | Can I pick up my order? A | Yes, absolutely. We will notify you when your order is ready for pick up. Q | What is your product’s shelf life? Q | Can I return unopened product for a refund? A | Yes. Unopened material can be returned for credit. Q | How much does your product cost? A | For our current pricing please give us a call.